One of the things I got for Christmas this year was a cast iron oval roaster. I don’t know if it’s TECHNICALLY a dutch oven, but it IS cast iron, you CAN put coals on top and below (with a stand), and you CAN (currently) use them in sanctioned Dutch oven cookoffs. So, I’m going to call it a Dutch oven. You can see, basically, what it looks like in the affiliate ad, there, on the right. Now, there’s all kinds of cool things you can do with an oval roaster, as a Dutch oven chef, that you can’t do as well with a regular Dutch oven. One is to cook a full rack of ribs. Another is to lay out a big, long fish, like a salmon, on a bed of potatoes or rice. I’d love to steam some rice under a few big long king crab’s legs! But what has had me wanting one of these for the whole last year was the opportunity to do French bread the way it’s supposed to be done, as a batarde shape. See, there are basically three shapes for french bread. The baguette is a long, thin shape, with a lot of crust, and not as much crumb. It’s great for dipping and for having alongside soups. The boule (or ball) is a round-shaped hearth loaf. That’s easy to do with a traditional Dutch oven, since it’s round, too. Then there’s the batarde. It’s somewhere in between the two. It’s shorter than the baguette, and fatter, but not fully round, like the boule. It has more crust area than the boule, but not as much as the baguette. It’s also what you find labeled as “French bread” in most American supermarkets. The problem with the Dutch oven is that you can’t do a baguette or a batarde shape. It’s just not long enough. But, the oval roaster IS! 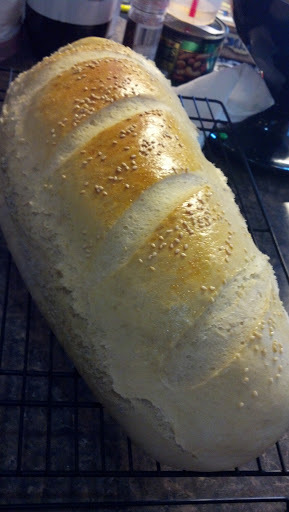 So, last week, I made a batarde of French bread, and it turned out GREAT! I basically did the same recipe and procedure as I did when I made the boule before, but did it in the different shape and oven. It’s a two-day process, with a preferment dough that rises overnight. This helps develop more flavor! You’ll also need a Dutch oven trivet, or stand, to raise the roaster up above the coals. The first step, the night before, is to make a “Pâte Fermentée”, or a preferment. This is basically a bread dough, that you let rise overnight, then use as a basis for more bread dough the next day. I started by mixing the yeast and the water. It doesn’t matter as much if the water’s hot, here, but I’m used to activating the yeast in 110° water. Just stir the yeast into the water and let it sit for 10-15 minutes. While waiting, I sifted the flour and the salt together. Once the yeast was a little frothy, I poured the yeast/water mix onto the flour and stirred it up. I shook a little flour onto my tabletop and kneaded it a bit. I went for a while, but I didn’t worry about a windowpane, because I knew that I’d be kneading it for reals the next day. I sprayed the bowl with oil, set the dough ball in, and sprayed it with oil. I covered the bowl with plastic and let it rise for about an hour. Then, it went into the fridge, for the long, overnight ferment. The next day, I pulled it out pretty early and set it aside to come up in temperature and rise a little more. I let it sit most of the morning. When I was ready to work it, I got another cup of 110° water (or close to it), and activated a little more yeast. I sifted 2 cups of the flour, as before, and added the salt. Then, I cut the Pâte Fermentée into a dozen or so small chunks. Finally, I combined the Pâte Fermentée, the flour mix, and the yeast mix and stirred it up. Then, I turned the dough out onto my floured tabletop and started kneading and flouring in earnest. This time, I really worked it, and kept at it until I got a good stretchy windowpane (see my breadmaking lens for a good explanation of the windowpane test http://www.squidoo.com/dutchovenbread). Once it was well-kneaded, I formed it into a boule, stretching and tucking the surface tight, and set it back into the oiled bowl. I oiled the surface of the bread, too, and covered it all to rise. It rose up very nicely, over the course of a couple of hours. When it had doubled in bulk, I went out and lit up a lot of coals. Once the coals were starting, I put just a little flour out on the tabletop, and dumped out the dough. I squashed and stretched it into a long, narrow shape, about a foot and a half long by about 3-4 inches wide. I stretched a nice, tight surface, and pinched the bottom tight together all along the length. I put that whole dough loaf onto a single piece of parchment paper (to make it easier to move). I set that aside to rise some more. Then, I went back out to my cooking area with my oval roaster. I spritzed some oil all over the inside, and set it up on my lid stand trivet. 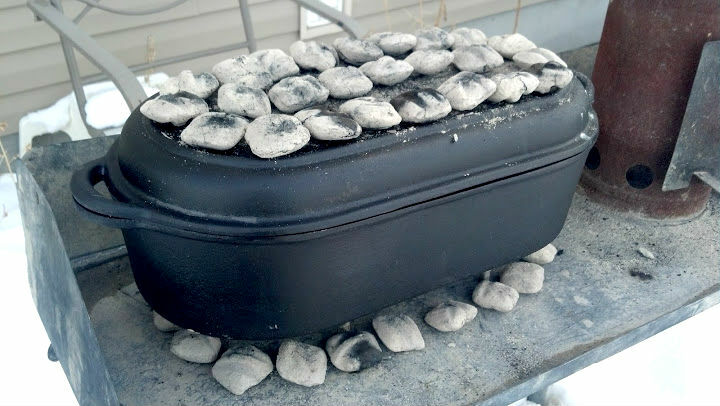 I put 18-20 coals below it, right under the edge, and 24-26 coals above on the lid. There was a limited space on the lid, and it didn’t have a high lip to keep the ash in, so I could tell it would be tricky to manipulate. But, I had to work with it. After about 15-20 minutes, the roaster was nicely pre-heated, and the dough had risen back up some. I took my razor, my dough, some hot pads, a short-stemmed thermometer, and my son to start the baking. While I carefully lifted the lid, he lowered the dough in on the parchment. Then, he sprinkled on some sesame seeds, slashed the top with the razor, in three long slashes, and stuck in the thermometer. I set the lid back on and marked the time. I also put a handful of fresh coals into the chimney to start. After about 15 minutes, I turned the oven around, and the lid as well, just to change the relative positions of the coals to the bread dough. That helps promote more even cooking. It was very tricky to turn the lid without shaking ash into the oven. I think next time, I’ll knock the ash off the coals and sweep it clean first. I put a few fresh coals at even distances above and below, mainly because they had burned down and it was very, very cold out. In the summer, or in lighter breeze, that might not be necessary. After another 15-20 minutes, it was done. I lifted up the lid, and the thermometer read at 190°. It can go as high as 200°, but the lighter white breads can be done at 190°. I shook the ashes off the lid and brought the roaster in. I lifted the bread out by the parchment paper and set it onto my cooling rack. It really looked nice! The crust wasn’t too hard, and the bottom was nicely browned as well. My wife said that it was the best bread I’d ever baked. I had some friends come over and share. 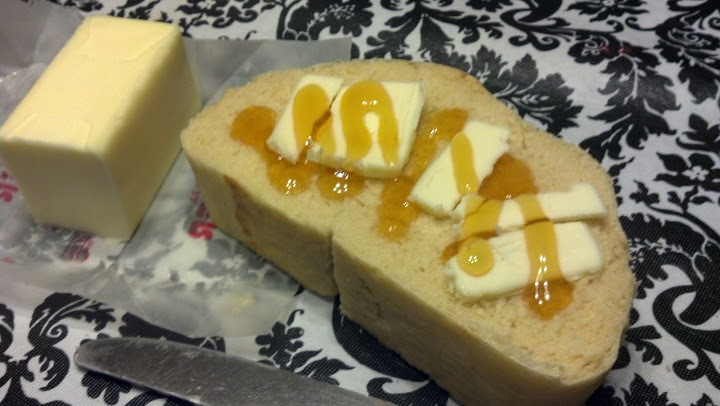 It was great by itself, and I also loved it with butter and honey! How to cook in a Dutch oven! And here are chicken Dutch oven recipes! It is so good to see pictures of your ovens on a cooking table instead of on the ground. Bet you are loving that table! @Ted: Thanks! @Ranes: Yes, yes, I am (my back loves it especially)!